IBMC students outside the Malta Stock Exchange. 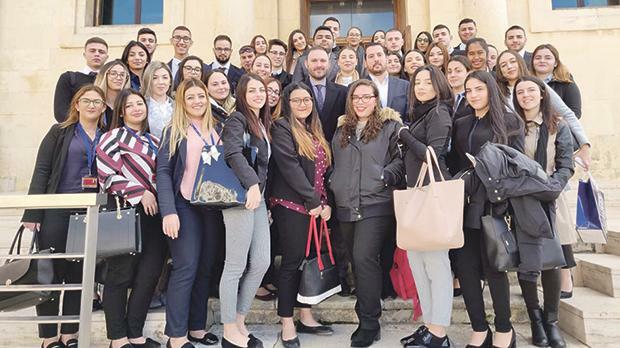 Students reading for the Advanced Diploma in Financial Services at the Institute of Business Management and Commerce (IBMC) at the Malta College of Arts, Science and Technology (Mcast) recently visited the Malta Stock Exchange in Valletta. This initiative was led by Mcast senior lecturer Michel Said and spearheaded by IBMC in partial fulfillment to its continued academic pursuit to further bridge industry knowledge, insights and networking opportunities to its numerous business management and commerce students – so as to collectively uphold the quality of the institute’s learning solutions. During the visit, Malta Stock Exchange manager Mark Borg Cardona gave those present a thorough overview of the central securities depository, compliance and market operations including the latest developments across fintech. In support of their Bachelor of Arts (Hons) in Business Enterprise, a group of second year students at the IBMC recently also visited Bank of Valletta’s headquarters in Santa Venera where David Pace Ross, senior manager at BOV Capital Markets and Institutions, delivered a talk about the group’s operations on capital markets and asset management divisions followed by a Q&A session.